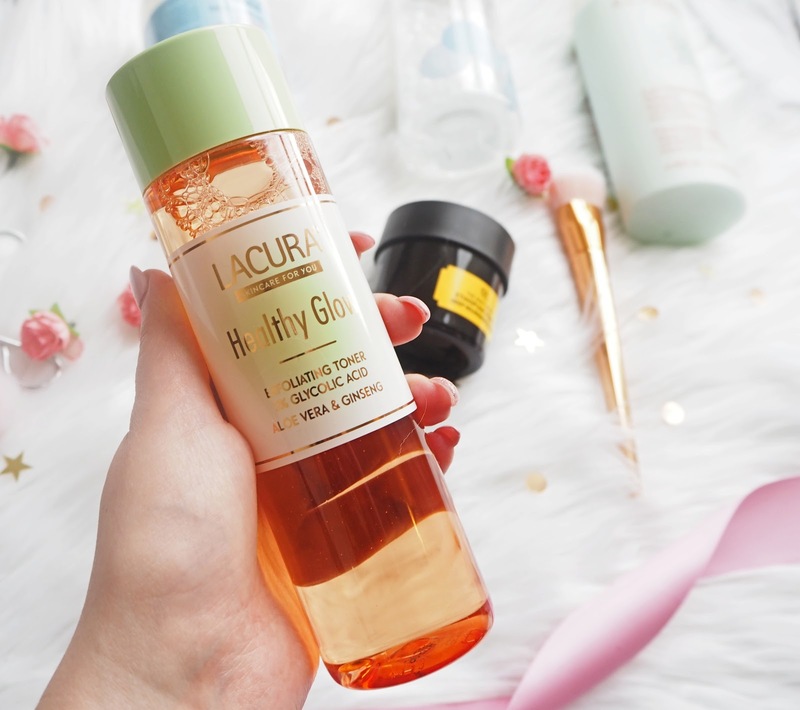 If you've been following me for a while on my blog or social media, you'll know that I often suffer with dry skin, particularly during the colder months. Over the years I've tried so many creams and skincare products; both high end and drugstore and I finally think I've got a good routine in place which has helped to prevent severe dryness and inject some moisture back into my face. 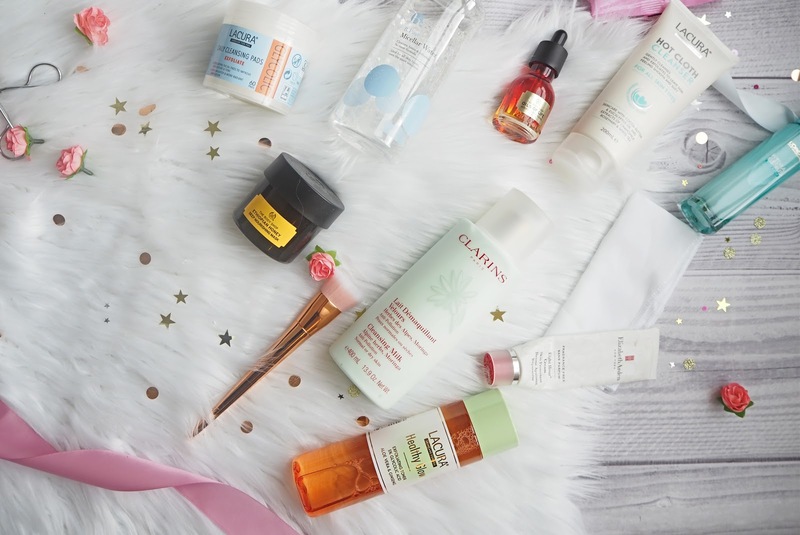 Today I'm going to share with you my favourite skincare products that help dry skin and talk you through my daily routine. The first step in my skincare routine is to remove my makeup. I like to try and do this as soon as I wake up in the morning and also when I get into the house after work to reduce the amount of dirt and dust on my skin. To take off my makeup I like to use a gentle face wipe from Primark to get the majority of my makeup off, before going in with some B. 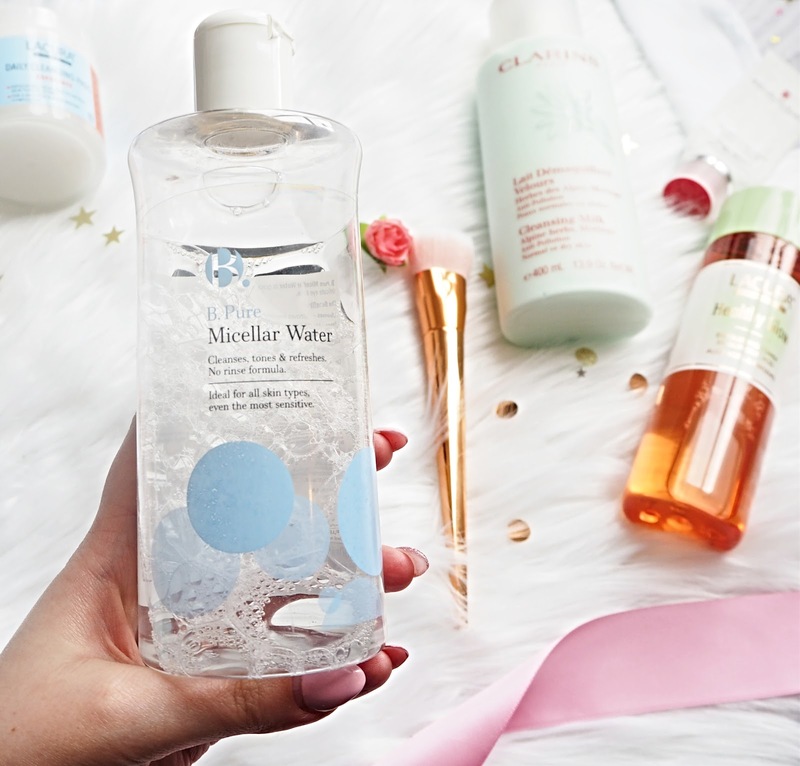 Pure Micellar Water from Superdrug on a cotton pad to remove any further build up of dirt. 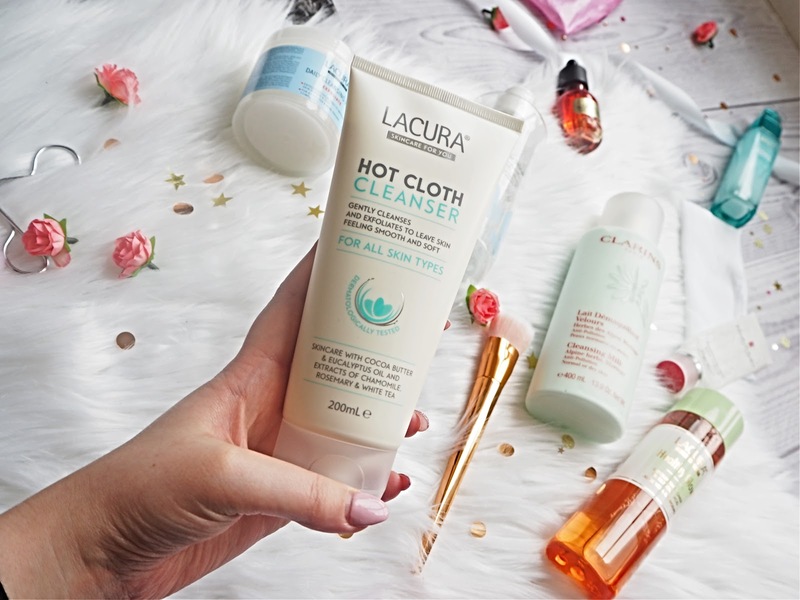 Once I've cleaned my skin I like to go in with a cleanser and I like to use the Lacura Hot Cloth Cleanser from Aldi. It's only £3.99 and you get a muslin cloth too and it's so so similar to the Liz Earle Cleanse & Polish which I've used in the past and loved. The Aldi version has a creamy formula and leaves my skin feeling smooth and hydrated. I love using the product with a hot cloth as it really helps to draw out my impurities however I do feel that the muslin cloth it comes with is quite harsh so I prefer to either use my flannel or my make up eraser cloth which does the trick. 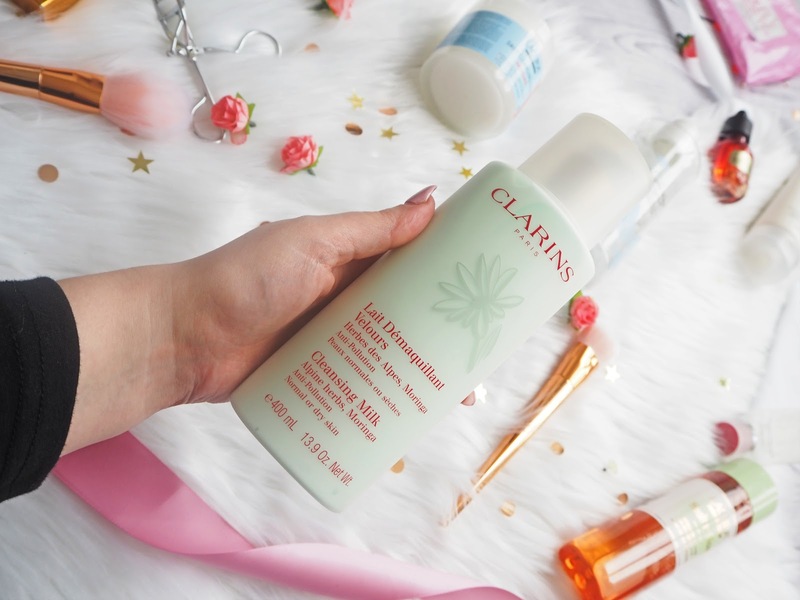 I also use the Clarins Milky Cleanser to remove any remnants of make up left on my face. I love the smell of this product. It just reminds me of holidays and soothes my skin, reducing redness and leaving the skin smooth. I tend to switch out the Clarins cleanser and the Aldi hot cloth cleanser depending on how much time I have. Once I've cleansed my face I like to go in with a toner. I've used the Simple toner before, which I really like however I saw this Pixi dupe in Aldi from Lacura a few months ago and have been loving it. The Healthy Glow Exfoliating Cleanser helps to gently exfoliate the skin whilst toning and brightening, leaving you with a healthy glow to your skin. I like that this toner leaves my skin feeling clean and fresh and I was surprised at how gentle it felt on my sensitive skin. 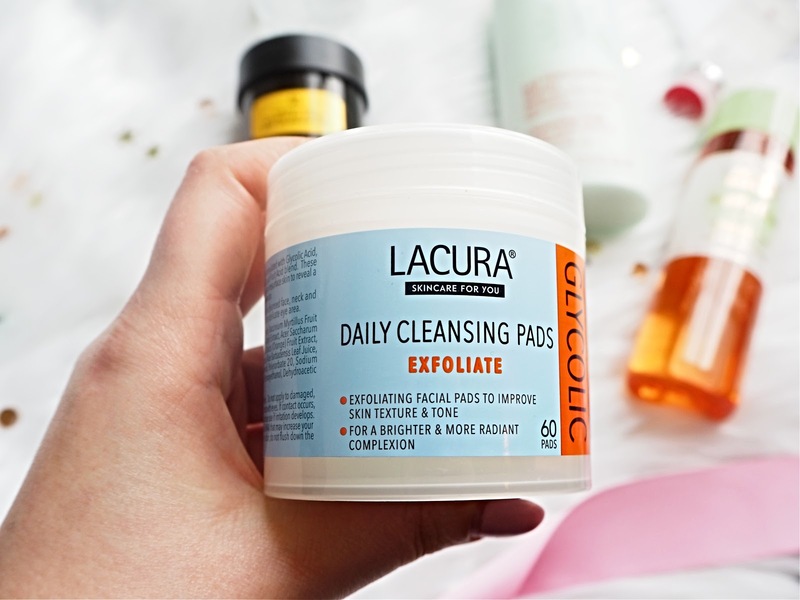 Every other day during the week I also use the Lacura Daily Cleansing Pads after cleansing my skin which aim to refine, re-texture and resurface the skin, leaving you with a brighter complexion. Even though they are daily cleansing pads, as my skin is sensitive I only use them every other day. 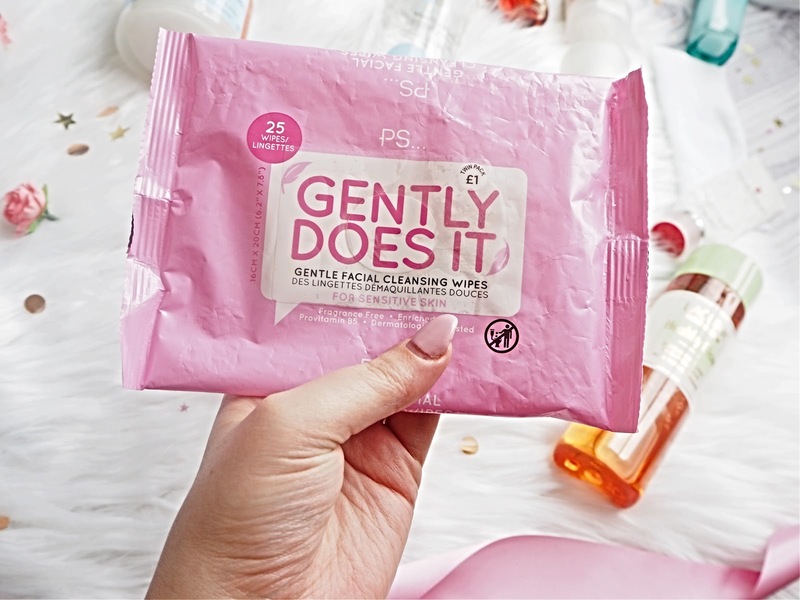 The pads are soaked in exfoliating glycolic acid and at £2.49 for 60 pads they're such a bargain! Once a week during a pamper evening I like to do a face mask to help rejuvenate my skin. 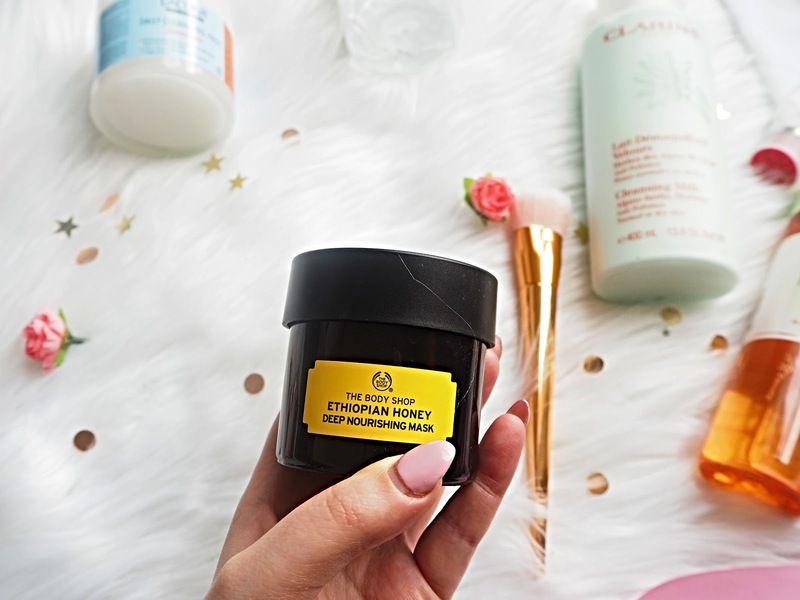 I often switch it up between sheet masks and the ones that you apply with a brush but at the moment I've been loving the BodyShop Ethiopian Honey Deep Nourishing Mask which makes my skin feel super soft, nourished and glowing. It has a gel like texture so doesn't feel tight on the skin upon applying. 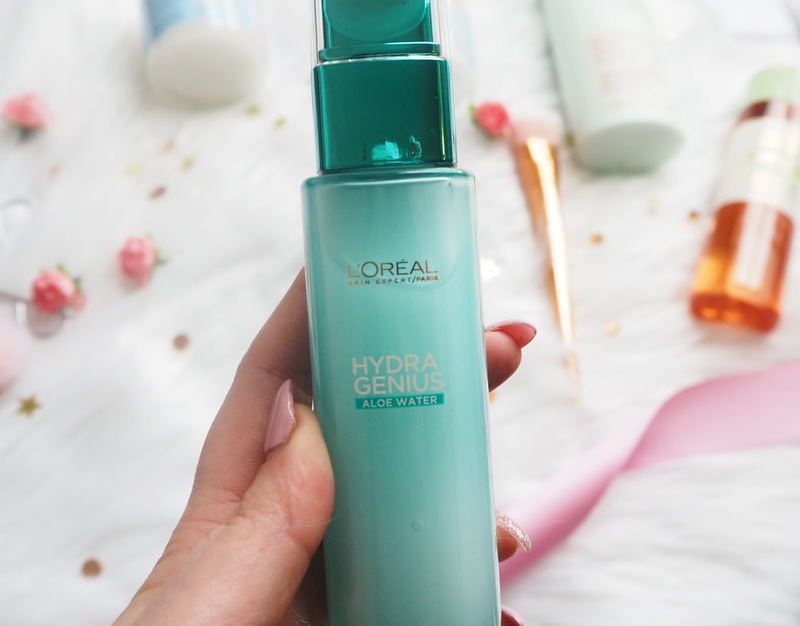 After I've taken the face mask off with some warm water and a flannel I like to lather myself in the L'Oreal Paris Hydra Genius Aloe Moisturiser which is amazing for dry skin. I've done a full review here, but in a nutshell I literally love it and it's now one of my holygrail products! I use this day in day out and swear by it for my dry skin. I always apply it before my makeup too as it helps give my face that glow! 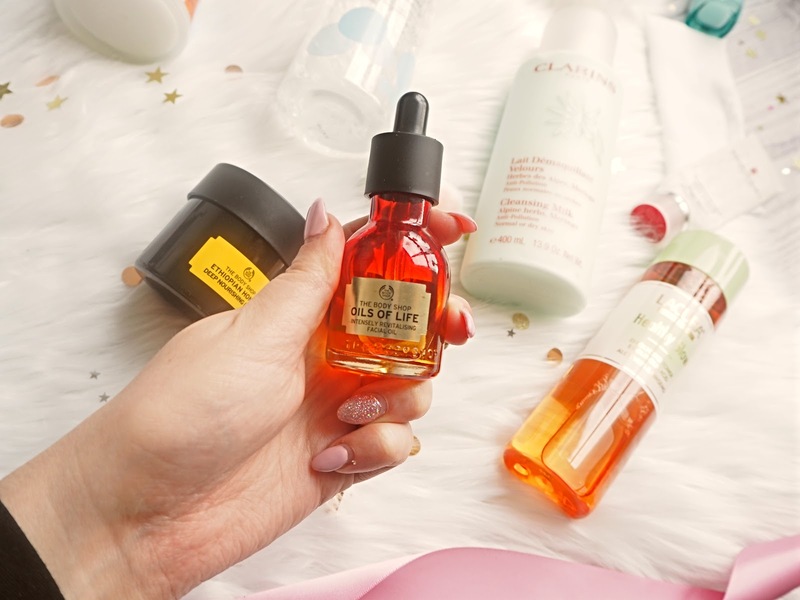 On an evening right before bed I sometimes also use the Bodyshop Oils of Life Facial Oil before moisturiser to give my face that extra bit of nourishment. I'm not lying when I say this, but this product has truly saved my dry skin. I suffer badly with dry skin so using this to inject some moisture back into the face overnight is the best thing ever. It also smells like a spa too. It is so worth the money. You can find a full review here. 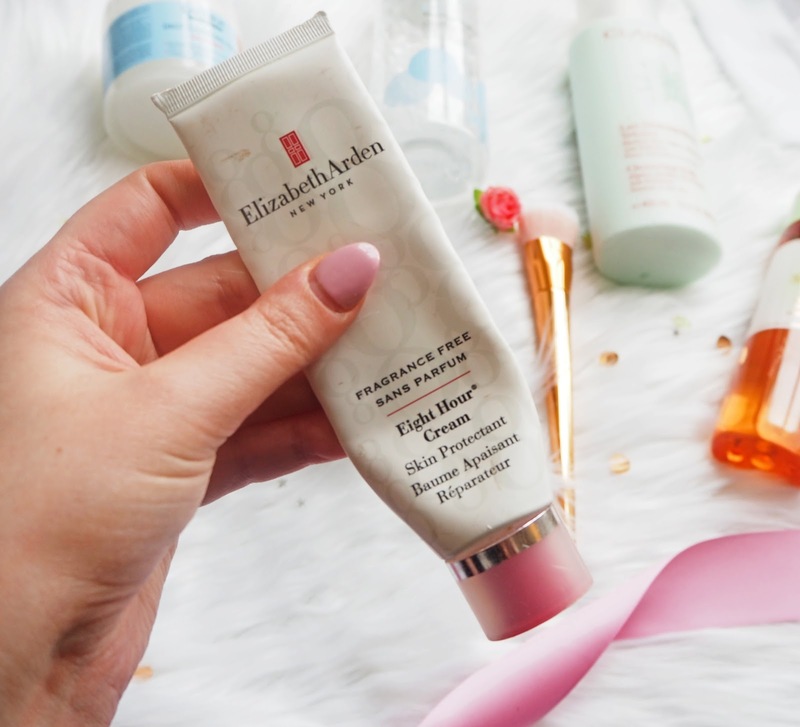 I also always apply my Elizabeth Arden 8 Hour Cream on the daily, basically ever hour! I swear by this stuff. It works wonders on my dry lips and I also sometimes use it on my skin too for the bad dry patches. I love this stuff, check out my full review here. There you have it, my current skincare routine for dry skin. If you suffer like me then I'd definitely recommend trying these products out. They're all so affordable too and don't irritate my sensitive skin. What are your favourite skincare bits? I'd love to know what you recommend in the comments below.